When by the grace of God Savvas had in a short time enlarged the lavra, increased the community, founded the cenobium of Castellium, and become exarch of all the other lavras and anchorites, his disciples and accusers mentioned above, all the more envious at the founding of Castellium, induced others in the community and, now forty in number, were driven by some evil demon to foment sedition against him. 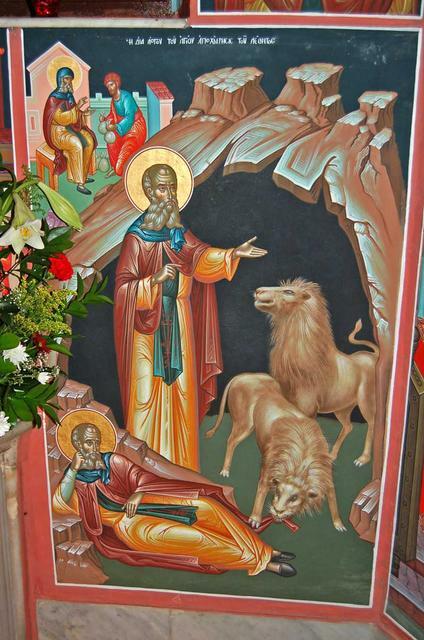 Our father Savvas, gentle towards men although a fighter against demons, yielded to them and withdrew to the region of Scythopolis; he settled in a desert spot by the river called Gadaron, and stayed there for a short time in a cave where an enormous lion was wont to withdraw. Around midnight this lion returned and found the blessed one sleeping. Taking hold of his patchwork habit with its mouth, it began to pull at him, striving to remove him from the cave. When he got up and began the night psalmody, the lion went out and waited outside the cave; when the old man had completed the office and lay down in the place where the lion was wont to lie down, it came in again and, taking hold of his patchwork habit, began to pull at him, trying to remove him from the cave. So, with the lion pressing him to leave the cave, the old man said to it in confidence of spirit, "The cave is spacious enough to provide plentiful lodging for both of us, for we both have the one Creator. As for you, if you want, stay here; if not, withdraw. I myself was fashioned by the hand of God and privileged to receive his image." On hearing this, the lion felt some kind of shame and withdrew.